As anyone who has read a short story by H.P. Lovecraft or Edgar Allen Poe can tell you, great works of horror transcend the time in which they were created. References, language or style might change, but something elemental remains, something still chills. The eerie and the uncanny retain their power in works of literature, though this is not always the case with cinema. Whilst an individual's imagination can make the fevered words of a drunken lunatic come alive in terrifying detail over a century after they were written, visual effects can often render what was once scary tame, or even silly. This is why the simplest effects are often those which have the greatest longevity. Think of the myriad ways in which the presence of the shark is indicated in Jaws; the underwater point of view shots as it approaches its victims, the floating barrels which chart its movement, and the slowly reddening water. None of these effects are big or flashy, and none of them actually depict the shark - because, famously, the big and flashy effects depicting the shark failed to work - but they all have the desired impact. Since there are no real effects to speak of, they retain their power to shock and terrify. The same is true of many of the techniques employed by Carl Theodor Dreyer in Vampyr. The supernatural elements of the story - in which a man named Allan Gray (Baron Nicholas de Gunzburg, credited as 'Julian West' so as not to bring dishonor upon his aristocratic family) arrives in a town under the spell of a vampire - are depicted using simple in-camera effects, dissolves and even basic shadow play. Invisible actions are shown using effects no more sophisticated than shadow puppets on a wall, yet the elegance of this simplicity is key to why the film is still so creepy. There's a tactile quality to these moments that fits the classical story of ordinary people stumbling across forces they can't fully comprehend. It has the timeless quality of a familiar, well-told campfire tale. Dreyer accentuates the otherworldly nature of the story through the visuals, which are ever so slightly fuzzy in a way that lends a subtle but unmistakable surreality to proceedings. The effect was achieved by shooting every scene through a piece of gauze held in front of the lens, creating a dreamlike feel. Vampyr was shot entirely on real locations and there's a wonderful frisson between the earthy realism of the surroundings - including a house which looks to be on the verge of falling apart at any second; it served double-duty as rat-infested accommodation for the cast and crew - and the vague unreality of the camerawork. It has the quality of a vivid dream, one in which you realise that something is drastically, tragically wrong, but are unable to quite put your finger on what that something might be. The performances amplify this feeling tenfold. 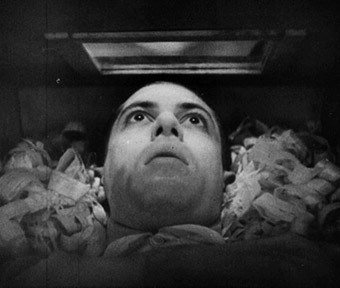 Vampyr was Dreyer's first sound film, though it's about as close to a silent film as a sound film can get. Dreyer and his co-writer, Christen Jul, kept the dialogue down to a minimum, whilst much of the narrative is driven by title-cards and most of the exposition comes from still shots of pages of a book. Rather than rely on words, the actors use bold, exaggerated expressions and actions to tell the story, in the process creating an even greater sense of the uncanny. The performances are not kabuki big, but they are just slightly larger than life enough to seem unreal without falling over the line into pure pantomime. Nowhere is this more true than in one of the film's most celebrated scenes, a dream sequence in which an exhausted Allan Gray imagines seeing himself buried alive. By overlapping footage to create a ghostly effect, we see the wraith-form of Gray watching his own dead body being put into the ground in a moment that relies on the expressiveness of de Gunsburg's face to put across the disinterested horror of a nightmare. It's a startlingly effective and experimental moment that demonstrates how simple techniques can be devastatingly effective, and how a film that is over eight decades old can still retain its power to imbue fear.